When I was in Pakistan I was on the hunt for a nauratan set (nauratan means nine, for nine different colours of stones). I think they’re so classic and versatile to go with any outfit. It was the classic part that got me laughed at by pretty much every shop keeper in Liberty…”Baji?! (Sister), nauratan is from an old time now, it’s not in fashion anymore!” This was basically the response I got from every shopkeeper I asked…you could have a set designed if you had a picture, but they just don’t have them readily available. In fact what was available, and everywhere, was jewelry that was full of crystal amethysts and multi coloured stones…the look of all these sets were very modern, and in my opinion absolutely gaudy. The new style of jewelry is not like that of our mother’s it, to me, looked like the type of jewelry you could get at People’s or the Bay. I think it was something different for the women living in Pakistan but for girls like me who go back home to shop it was nothing special! Anyway, here’s a pic of the closest thing I found to nauratan, but this too, was not what I had in my mind. 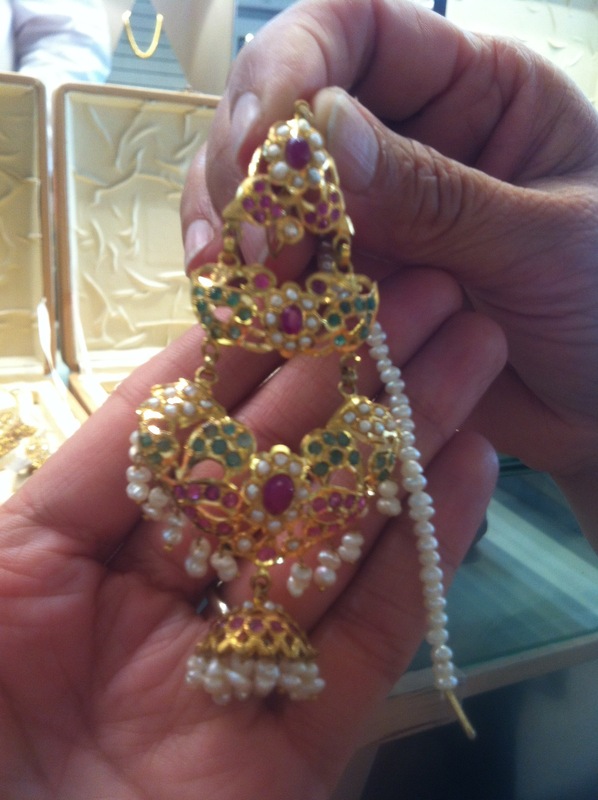 hey what store did u find these at…when u went shopping do u remember if u saw any long rani haars the ones that are made from pearls..i live toronto too and will be going to lhr for wedding shopping in dec..
Hey Danya! The pearl choker sounds lovely, pearls are my favorite 🙂 I hope you find the rani haar, maybe you’ll find a shop where someone has sold theirs from that zamana – the gold from our moms generation and previous is just something else. I’m wearing my mom’s set too on the wedding day just as is 🙂 oh I don’t mind sharing – I didn’t want to spend more than 1.5 lakh on my dress either (everything really adds up!) and when I went to karma I tried on the dress and they said it was 3.5, which was way more than I wanted to spend, then I told huma at karma (she’s awesome) that my budget was 1.5 and if she could do anything in that range and she said for the dress I wanted if she reduced the kaam in some areas, she could do it in 2. So after seeing everything in liberty and seeing that their prices in liberty were all 1 lakh or up (I thought liberty wasn’t designer designer so it would be less – but found it wasn’t, plus I didn’t like any of the styles there – too loud and blingy) I ended up going back to karma and getting it from there. We figured for an extra $500 and designer it would be worth it – and it totally was they made it in two weeks and it fit me perfectly, (and couldnt even tell there was any kaam reduced!) alhamduliah, I was lucky ! Karma is one of the designers that still works in your budget so if u told them u want something in 1 lakh u might be able to get something lighter made. Mehdi on the other hand was crazy expensive – they start at 4 for bridal and go up to 14! But I was never fussed about designers I just wanted to find something I liked, that had fine kaam – for example I found my Mehndi lengha in a shop in liberty and it was only 27000 and I absolutely loved it. So it is possible to find nice and budget friendly outfits, i just found because I wasn’t a fan of the new styles it was a lot harder ..I ended up liking very few things! Glad you’re finding the blog helpful i knew before I went I was doing as much research as I could too from blogs and forums!